If we aggregate the parties’ votes and seats in this week’s Catalan regional parliament election by pro-independence and pro-union blocks, we find the election produced a plurality reversal. That is, the pro-union parties won more votes, but the way the separate parties’ votes were translated into seats by electoral system resulted in a pro-indepdence assembly majority. The voting result between the blocs was not even very close, those opposed to independence winning by about 4.6 percentage points. This sort of thing should not happen under PR, but can happen when the system is malapportioned and the geographical distribution of party support favors the over-represented side. I thank David Lublin for pointing this out, via an email message, the contents of which I am sharing here, with his permission. In this first table are the votes by party and electoral district (data from El País). The main pro-separatist parties are JxC, ERC, and CUP, and these together have 70 of the 135 seats (as the second table below shows), but only 48.3% of the vote. And here is a table David prepared of the same votes run through alternative electoral systems. (3) Four Districts (actual system) v. Single District. Manuel Alvarez-Rivera had previously noted the impact of the electoral system on the 2015 election, at which such a reversal also occurred. Manuel’s observations can be found both here at F&V and at his own blog, Electoral Panorama. The 2015 reversal was less severe than this year’s because in the earlier election the pro-union parties won the vote just 48.1% to 47.8%. Catalonia and the rest of Spain need many things to work out their relationship (with or without separation). But one thing that clearly would help would be an electoral system for Catalonia’s own parliament that reflects how its people actually vote. I suppose it would not be an exaggeration to say that tomorrow’s election will be the most watched election ever for the regional parliament of Catalonia. I certainly do not know anything about Catalonian politics, but indications are that the vote will be close between parties favoring secession and those favoring remaining in Spain (while perhaps advocating a new set of center-region arrangements). The electoral system is quite proportional. At least according to the Wikipedia page on the 2015 election, the assembly size is 135. There are four districts, which makes for a mean district magnitude of 33.75. With a seat product of 135 * 33.75 = 4556.25, we should expect an effective number of seat-winning parties around 4.07. However, in 2015, the actual value was a good deal lower than that, at 3.60 (or 88% of expectation). This was due to a large leading party, which in that election was Together for Yes, with 62 seats (45.9%). Based on the seat product, we’d expect a largest party of around 35% of seats. Naturally, with such a high seat product, the differences between percentages of seats and votes should not be large. Together for Yes had 41.3% of the votes (ignoring blank votes); overall deviation from proportionality is 3.78% (Gallagher index). While not especially high, that is a little more disproportional votes-to-seats translation than I would expect. There is a legal threshold of 3%, applied in each district. But with the smallest district having a magnitude of 15, this would not have much effect. Besides, the wasted vote percentage (non-blank votes for parties winning no seats) was only 1.1%. So where does the disproportionality come from? Some of it is from the use of D’Hondt allocation, but with such a high seat product, even D’Hondt should not swing six seats to the largest party (the difference between a purely proportional result, to the nearest integer, and the actual result, for the largest party). The small but potentially significant disproportionality of party votes and sats must be due to malapportionment. The largest district has 85 (!) seats. This is, of course, Barcelona. That makes it one of the very largest districts in use anywhere. Obviously smaller than the single districts in Israel (120), the Netherlands, and Slovakia (both 150), and formerly in the Russian Federation and Ukraine (both 450), but one of the largest in any recent time in a districted PR system. (I recall Indonesia used to have an 85-seat district; Brazil has one with 70*.) However, it is plausible that Barcelona’s 85/135 seats is under-representative of the capital district’s share of the population. The source I am using does not have vote totals, let alone populations, by district. Maybe someone reading this has that information. It is actually pretty striking to see such disproportionality in a system in which the range of magnitudes is 15 to 85! Not that it is highly disproportional, but relative to what we might expect from such high magnitudes and seat product, it is on the distorted side. And, in a close election with a crisis over the territory’s status, the electoral system may prove decisive. VanDeGraph of youtube recently put up an excellent video explaining Spain’s autonomous regions. He does a very good job of explaining the crucial distinctions between between federal and unitary states, and why Spain, despite its very high degree of decentralization, is not (strictly speaking) federal – and, by implication, why some countries which do not actually call themselves federal probably are (e.g. South Africa). I do, however, disagree with VanDeGraph’s distinction between federations and confederations as hinging on the right to secede, or that federalism necessarily excludes this right. If a projection from elespañol (which I found by way of Europe Elects) proves to be essentially accurate, Spain’s general election this Sunday could produce a wee bit of a break with the country’s party-system tradition. The blue line in the graph tracks the effective number of seat-winning parties in Spanish elections since the return to democracy in 1977. The red line is what we should expect it to be, given Spain’s “moderate” proportional system–where the many districts with small magnitude (number of members elected) has led some scholars to call it an essentially majoritarian, rather than proportional, system. In fact, it has not been uncommon for a single party to win a majority of seats, despite less than half the votes–a rather unusual occurrence under “proportional” rules. 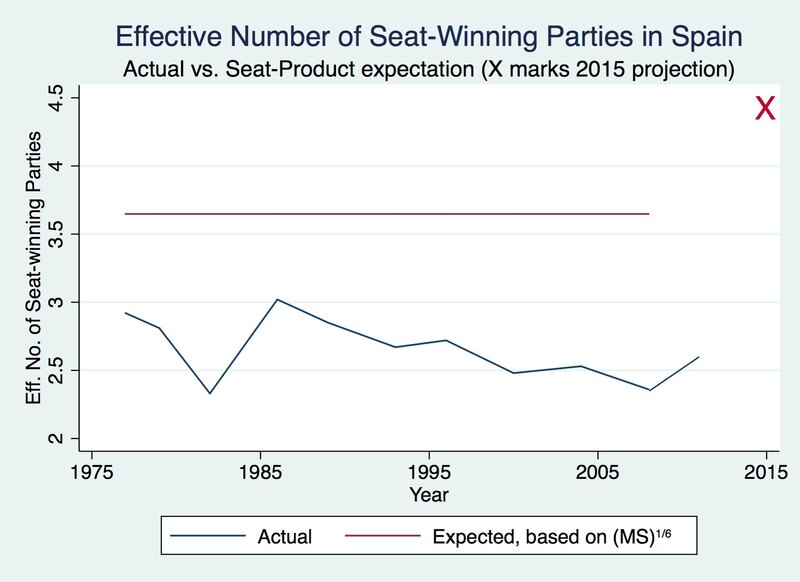 Specifically, the “expected” value is based on Taagepera’s (2007) Seat Product model*, given Spain’s mean district magnitude (around 7) and assembly size (350). The rules have been constant, thus the expected line is straight. Needless to say, Spain has tended to be rather under-fragmented, relative to expectation. We should expect it to have an effective number of seat-winning parties of 3.65, yet the actual value has not even been above 3.0 but once, and has averaged a bit more than 2.5. The bright red X is what it will be in this election if the projection were to be the actual result. In the trade, we call this an over-correction. There was a small uptick in 2011, after a long period of steady decline brought on by the dominance of the two main parties, Socialist PSOE and the Popular Party (PP). But the 2011 increase is nothing compared to what could be in store in this election, with the emergence of two new parties, Podemos (on the left of the political spectrum) and Ciudadanos (on the right), which could jointly hold more than a third of the seats. What this outcome might mean for government formation is an interesting thing to speculate on. I will not offer such speculation, but I am sure some readers have been following the pre-election conversation in Spain about the likely post-election options. And the effective number of parties by seats (NS) and votes (NV) for each election. Note that the 2015 projection would be so out of line that it actually would raise the full-period mean from 2.66 to 2.81, despite being just one of 12 elections. I put “5?” in the NV cell for 2015, because Li and Shugart (2016; see footnote for link) show that, on average, NV=NS+.6. In Spain, the mean difference has actually tended to be a little higher, at .84. So maybe we will see an effective number of vote-earning parties around 5.3. That would be something–a value we might expect to see in Denmark or Israel (before its fragmentation really took off in the 1990s). This looks to be one of those rare cases of a really serious shake-up election. * The Seat Product is district magnitude, M, times assembly size, S. The model states that the effective number of seat-winning parties, Ns=(MS)1/6. Despite its poor accuracy for Spain, it is overall extremely accurate. See Yuhui Li and Matthew S. Shugart, “The Seat Product Model of the effective number of parties: A case for applied political science“, Electoral Studies 41 (March 2016): 23–34. The main secessionist group “Junts pel Si” (Together for Yes) was on track to secure 62 seats, while the smaller leftist CUP party would get another 10 [out of 135]. Their votes combine for 47.8%, and there was “record turnout” (78%). This F&V planting is located in “Spain” because, at least for now, it is. Leaders of Los Inignados, the Spanish protest movement that preceded the worldwide “occupy” phenomenon, have decided to form a political party, Partido X (see Guardian, 20 Oct.). Spain’s party system has been remarkably stable since shortly after democratization. The news story says Parido X is aiming for 25% of the vote in the next election–which it also says “most observers say is fanciful”. 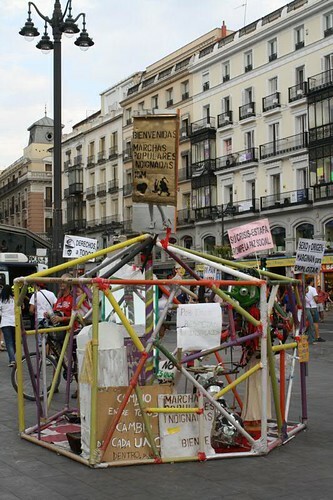 The protest camp in Madrid’s Puerta del Sol square began in May, 2011. I was in Madrid in July of that year, and now is as good a time as any to post one of the photos I took then. A few days later, police cleared the site.